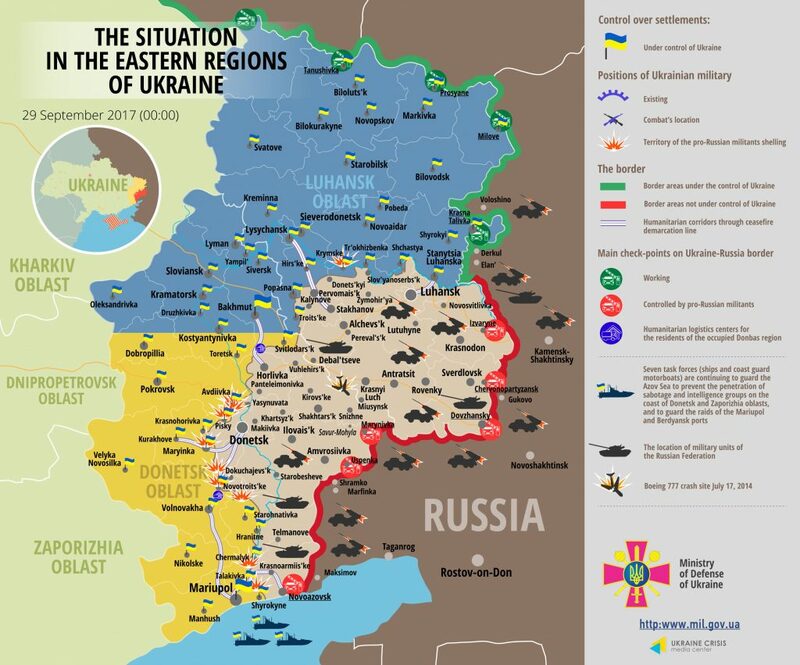 Two Ukrainian troops died in action in the ATO zone yesterday, and two were wounded. The largest number of attacks happened in Mariupol sector, where militants violated the ceasefire nine times. In particular, intense mortar attacks happened in Maryinka at dawn and in the afternoon. “Militants hit residential quarters during the second attack. In total, militants fired over 30 mines,” informed Ukrainian Ministry of Defense spokesman on ATO- related issues Colonel Andriy Lysenko at a press briefing at Ukraine Crisis Media Center. Moreover, militants violated the ceasefire in Berezove, Pavlopil and several other strongholds, mostly at night time. “The enemy did not use heavy weapons there. Nevertheless, hostile attacks were long-lasting and intense. As a result, Ukrainian troops responded with fire, deploying armored weapons, among others,” said Col. Lysenko. Five hostile attacks happened in Donetsk sector yesterday. Russia-backed militants violated the ceasefire only in Avdiivka-Pisky frontline, both at daytime and during the hours of darkness. No heavy arms were used. In Luhansk sector militants conducted two attacks in Krymske – in the morning and around 17:00. “Militants used light weapons, and Ukrainian troops responded with fire in both cases,” said Col. Lysenko. Report on the military developments as of September 28 is available here. Interactive data on the shelling: chronology shelling chart and the interactive map.